The recent spate of signings has calmed down the F1 driver market to some extent with very few seats now available for next year. Scuderia Ferrari Marlboro will remain the same as this year with Michael Schumacher and Rubens Barrichello and, presumably, Luca Badoer continuing as the test driver. There could be a second test seat, the job is currently shared betwenen Luciano Burti and the lesser known Andrea Bertolini, who steps in when others are not available. McLaren will have Kimi Raikkonen and Juan Pablo Montoya but it is not yet clear whether Alexander Wurz and Pedro de la Rosa will stay on as test drivers. It is possible that David Coulthard might test for the team although he says he is keen to go on racing. Williams will run Mark Webber and probably Jenson Button. If Button is forced to at BAR-Honda next year Williams will need to look again and the team is believed to have a list of other possible drivers. The man who is most likely to get the job is probably Antonio Pizzonia because he knows the team, knows the car and has done well in recent races. Renault will run Fernando Alonso and Giancarlo Fisichella but the test driver is not yet known although the team is expected to sign up the latest Renault Driver Development graduate Heikki Kovalainen, who will be looking to break into F1 after a successful year in the Nissan World Series. BAR-Honda has Takuma Sato under contract and wants to keep Jenson Button as well. If Button goes to Williams the team needs a replacement for him and this is the source of much speculation at the moment with the names in the frame including David Coulthard, Anthony Davidson and Vitantonio Liuzzi. There might even be a chance for Antonio Pizzonia. There are suggestions that Britain's Jamie Green might be a test driver although Enrique Bernoldi would probably also like to have the job. Sauber will run Jacques Villeneuve and Felipe Massa and may have a test driver. This could be Gary Paffett or might be the team's current third driver Neel Jani. The future of Jaguar Racing remains a little uncertain at the moment but the team is hoping to keep hold of Christian Klien. There are no decisions as to who the other driver might be but David Coulthard is probably a candidate. Sweden's Bjorn Wirdheim is probably in with a chance as well. Liuzzi is also highly-rated by the current Jaguar management. Toyota has made its decisions and will run Ralf Schumacher and Jarno Trulli with Ricardo Zonta and Olivier Panis testing. The team will also try to place Ryan Briscoe in another team, probably Jordan or Minardi. 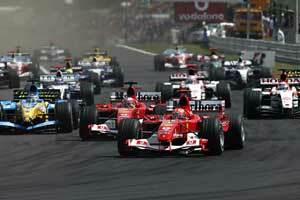 The two small teams are still not sure to be around in 2005 although both Paul Stoddart and Eddie Jordan are fighters. The future of these drives will, to a large extent, be decided by money as both teams need the finance to run. There are some other drives going in various testing roles and with the 11th team which is currently being put together. This will test in 2005 and so at least one driver will be needed.